We offer postcards to send to your friends as a congratulations card or as an invitation if you are thinking about organizing a Spanish event or party. 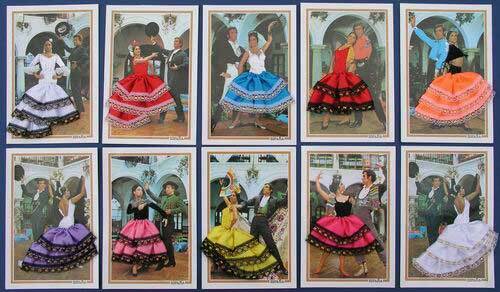 These postcards are very original and bright and colourful: some couples with a very flamenco pose. The clothes of the flamencas are made of fabric. Postcards assortment sold by lots of 10 items. The post cards reminded me of my childhood- LOVE THEM! These postcards are magical and represent the folklore of Andalucía.